2007, TERRY MOORE, STRANGERS IN PARADISE (SIP), FRANCINE & KATCHOO, (11 X 17)! Terry posted this piece to his blog and gave it this background story. Here is a recent shot of Francine and Katchoo, post-SiP. They still look good, dont they? I chatted with them briefly. They stopped by the studio before leaving for the airport. Francine smelled of baby powder and Katchoo smiled a lot. SOON TO BE A MOVIE! 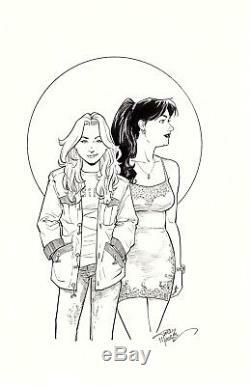 The item "2007, TERRY MOORE, STRANGERS IN PARADISE (SIP), FRANCINE AND KATCHOO! (11 X 17)" is in sale since Sunday, April 22, 2018. This item is in the category "Collectibles\Comics\Original Comic Art\Covers". The seller is "mirth181degrees" and is located in Bakersfield, California. This item can be shipped worldwide.